Do you want to expand knowledge in applied leak detection technology for people in your organization? Sam Godfrey is here to help! 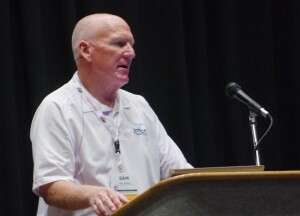 He is available to speak about applied leak detection technology at venues ranging from conferences and conventions to corporate brown-bag seminars. His audiences include engineers, city council members and managers. He emphasizes the practical ways in which leak detection programs can conserve water and reduce water production and distribution costs. CEUs are frequently available for those interested. He has also provided sessions for a number of corporate engineering firms, and public entities such as Brazosport Water Authority, Edwards Aquifer Authority, Guadalupe-Blanco River Authority, Post Oak Savannah Groundwater District, South Texas Water Authority and a host of municipal officials. If you are interested in having Sam speak to your organization, please contact us today.